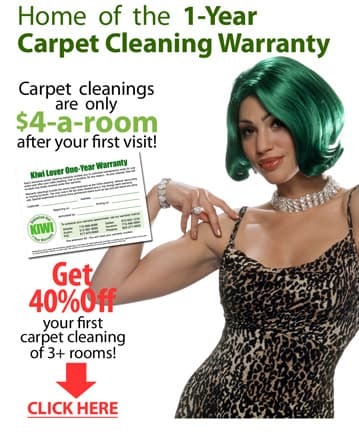 When your carpets are looking a little worse for wear, call KIWI Carpet Cleaning! The Hills, Texas customers enjoy first rate carpet cleaning at a price that is affordable all year with KIWI’s famous one-year warranty. So why wait any longer? KIWI Services proudly gives the KIWI Lover One-Year Carpet Cleaning Warranty to those customers who spend $120 or more on their initial cleaning. Warranty customers are entitled to a full year of unlimited warranty cleanings for just $4 per room, plus a $37 trip charge. Never again will you need to worry about pesky pet stains, dripping candle wax, or any other incident that’s bound to happen on your carpets. As long as you have KIWI, your carpets are covered. KIWI Services has a commitment to keeping services safe and healthy for your family, as well as the environment. That’s why we only put all-natural ingredients in our carpet cleaning solution so that they are 100% safe for your entire household, including the kids and pets. We also only choose to use the dry carpet cleaning method, because it produces no wastewater and dries in about 15 minutes, getting you back onto your carpets and life sooner. Call the Austin area KIWI Services Center to schedule a carpet cleaning in The Hills!